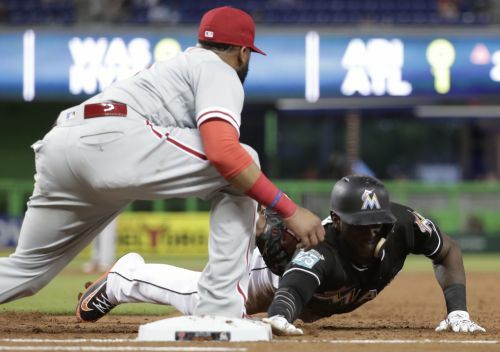 MIAMI (AP) — The biggest play of the night for the Philadelphia Phillies started in the middle of the sixth inning, when manager Gabe Kapler switched things around in the outfield for a little more defense. Aaron Altherr drove in his first run of July and — shortly after getting moved from center to right — started a sensational relay , helping Jake Arrieta and the NL East-leading Philadelphia Phillies top the Miami Marlins 2-0 on Friday night. "It may have been our most impressive all-around play," Kapler said of the relay. "Well, there have been a lot of them. But that was a very impressive all-around play. Nice job from start to finish." It went like this: Pinch hitter Derek Dietrich drove a ball within a couple inches of clearing the fence in right. Altherr played the carom and made a one-hop relay throw to Scott Kingery in short right. Kingery turned and fired the ball to catcher Jorge Alfaro barely in time for him to slap a tag on the back of Cameron Maybin's leg before he could get a cleat on home plate. "Not an easy play at all," Arrieta said. "That was huge. That was huge." "You talk about little things in a game," Mattingly said. "It changes probably how we pitch, the guys we use. ... It's a difficult one. I'm not sure what the thought process was with the read from Cam." For Marlins starter Wei-Yin Chen (2-7), it was another brilliant home showing. He allowed one run and five hits in six innings, striking out eight — his most since May 2016 — and walking one. At home this season, his ERA is now 1.83. On the road, it's 10.47. "Wei-Yin was very good," Mattingly said. "The first couple of innings they got some hits but then he seemed to find a little groove. He was lights out the rest of the night." Phillies: Philadelphia was playing its third game in three cities in three days — at the Mets on Wednesday, at Baltimore on Thursday and then the opener in Miami. So the lineup got shook up a bit, with newly called-up Trevor Plouffe getting his first start of 2018 and batting third, Kingery batting fifth for the 10th time this year and Alfaro in the No. 6 hole for the third time. Marlins: OF Lewis Brinson's right hip injury is worse than first thought. Originally thought to be merely inflammation, Brinson has now been diagnosed with a bone bruise and could be out for several more weeks. Brinson is hitting only .186 this season. Dodgers second baseman Chase Utley, a Phillies legend, said Friday he is retiring after this season. That brought up a certain memory for Kapler, who was there for Utley's first hit. Kapler was the starting right fielder for Colorado on April 24, 2003, and that initial Utley hit — a grand slam — sailed over his head on its way toward becoming a souvenir. "I remember it well," Kapler said. Imagine this: Marlins catcher J.T. Realmuto is going to the All-Star Game, and that selection isn't even the best part of his week. Realmuto was back in the lineup Friday night after missing three games for the birth of his daughter. "It's definitely been an exciting week so far," Realmuto said. The Phillies are 53-40 through 93 games. That's better than their 1980 and 2008 World Series champion teams were this deep into a season — the Phillies were 48-45 in 1980, 50-43 in 2008. Meanwhile, the 2017 Marlins had Giancarlo Stanton, Christian Yelich, Dee Gordon and Marcell Ozuna. The 2018 Marlins don't, and it barely has mattered. Through 96 games last season, the Marlins were 44-52 — this season, they're 39-57. RHP Aaron Nola (12-2, 2.27 ERA) tries to become the NL's first 13-game winner when he gets the ball for the Phillies on Saturday afternoon. RHP Trevor Richards (2-5, 5.24 ERA) starts for Miami.